1958 EPIC SERIES Stratocaster Pickup Set Authentic in Every Way, We Have Recreated The Tone! 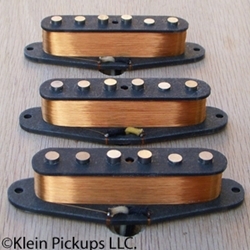 - Magnets, Our Epic Series 1958 Pickups use Original Fender Alloy Alnico 5 Magnets From 1958. We sent Original magnets from a 1958 pickup to an Independent Laboratory for Metallurgical Chemical Analysis Testing. We then contracted direct with our magnet manufacturer to get the Alnico 5 magnets Specially Poured to the exact composition of the Originals. We are the only manufacturer who offers this. Pure, Sweet, and Authentic Tone. - Wire, our 42ga Heavy Formvar wire is not just stock wire. We have sent dozens of samples of wire from early stratocasters for analysis. We get our 42ga Heavy Formvar built to the exact specs of the samples we have had analyzed. Exact Resistance, Exact ID & OD, & Color matching. Our 42ga Heavy Formvar Wire is the most authentic and accurate Magnet Wire Available. Our 1958 42ga Heavy Formvar wire for the 1958 Spec is ONLY USED ON THE 1958 Models. Authentic as it can possibly get. - Tone, the tone of our Authentic 1958 pickups is just amazing. You will never hear a more pure sounding pickup. People often ask us why vintage pickups sound so good. Well, the main reason why is that materials used in the 50s & 60's are not the same as today's off the shelf parts. Replicating every alloy, every element, every aspect of a pickup is why our 1958 Epic Series Pickups sound identical to a real 1958 pickup. 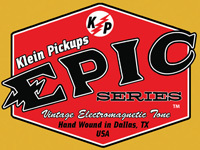 We get every part of the Epic 1958 pickups specially manufactured, only for us, from an actual 1958 pickup. We've A/B them and the tones are identical. 1958 Epic pickups have a Big and Fat low end, often not associated with current magnets as current magnets have a nasty Mid Range presence that also pairs with the chunkyness. The mids on the 1958 set are very solid, not overbearing but are shifted to the lower mid frequencies not the upper dark mids. The treble is crystal clear and melodic. - Compression, the current Alnico 5 alloy is very strong, very bright, & has quite a brittle edginess. One of the first things that is noticeable is that original magnets aren't as strong. This is not due to demagnetizing, but it's due to the chemical composition. 1958 guitars are know for their sweet clean tones but with their uncanny ability to drive the signal with out a heavy mid range. The pickups are just that, clean & driven. The pickups also have another characteristic from vintage strats that is not found in current materials, as known from the guitar aficionado & collector community, 1958 strats have a natural swirly-ness to them, similar to how a vox & matchless amps swirl when notes ring out. 1958 strats are the only year of strats that contain this characteristic. This pickup is the only pickup in the world who retains these natural swirls. Now is your chance to play with the same 1958 pickups with out the steep price tag of buying originals. We tested these pickups in multiple strats, Alder, Ash, Mahogany, Basswood, in both Maple & Rosewood necks. There was no combination that did not sound excellent. These are the most authentic and reasonably priced 1958 stratocaster vintage replacement pickups on the market.